Healthy, veggie-packed green enchiladas make a delicious spring or summer weekend dinner. Vegan & gluten-free with tomatillo sauce & poblano cashew crema. Nothing like a five o’clock Friday post the day before Cinco de Mayo… I’m sure everyone’s off on a patio with a margarita in hand by now, but I just had to get this one last recipe out before I go pour my first happy hour drink. We made this last night (hence the late post). 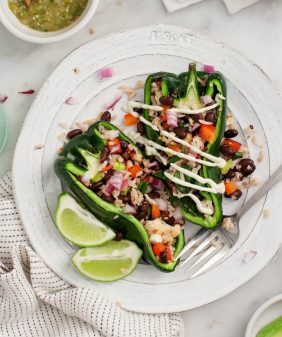 I’ve posted cashew cream before, but I have to say that this roasted poblano version really takes the cake. If you make only one component here, make that. It’s a wonderful creamy sauce on these vegan enchiladas, but it would be delicious dolloped onto many things (ie. the salad I ate for lunch today), or by itself as a dip. Heat the oven to high broil. Spread the poblano, tomatillos, and jalapeño on a baking sheet and broil. After 5 minutes, check for blistered skin and rotate the vegetables. Roast until blistered on all sides, checking and rotating every 5 minutes. I broiled my tomatillos and jalapeño for 15 minutes and my poblano for 20. When the poblano is fully blistered, place it in a bowl covered in a towel or plastic wrap for 15 minutes to cool. Meanwhile, make the tomatillo salsa: Remove the stems of the roasted tomatillos and jalapeño and place in a food processor. In a medium skillet, heat a drizzle of olive oil and sauté the onion until golden brown. Stir in the garlic and cook a minute longer. Add the onion mixture to the food processor and use a few short pulses to combine the roasted vegetables and the onion mixture. Turn the salsa into enchilada sauce: Wipe out the skillet you used for the onion and add the salsa to the pan. Cook over medium heat, stirring continuously while it starts to bubble and reduce. Add the ½ cup water and a pinch of salt to the pan and let the sauce reduce a bit more. Taste for seasonings. Stir in the cilantro and set aside. Make the mushroom sauté: Wipe out the same pan that you’ve been using. Heat a splash of olive oil over medium heat and add the onion and a pinch of salt and cook until translucent. Add the mushrooms and cook for 8-10 more minutes, stirring occasionally, until they brown and cook down. Stir in the garlic. Turn off the heat and add the spinach, stirring until it wilts down from the heat of the mushrooms. Set aside. In a shallow dish that’s larger than your tortillas, pour in a bit of the tomatillo sauce and a splash of olive oil. Dip each tortilla into the sauce, flip it over to coat, and set aside until you’ve dipped each one. Splash a little olive oil and a few scoops of the sauce into the bottom of a casserole dish. Take each tortilla, fill it with the mushroom and spinach sauté, and roll it up. Place the tortillas snuggly next to each other in the dish. Pour more (not all) of the tomatillo sauce over the top. You’ll want to reserve a bit of sauce to put on top after they come out of the oven. Bake for 20-25 minutes. Meanwhile, make the cashew crema: Slide off the skin and remove the seeds and stem from the roasted poblano. Blend the poblano, the cashews, ¾ cup water, garlic, onion, lemon juice, and salt in a high-speed blender. Taste and adjust seasonings to your liking. Set aside. Remove the enchiladas from the oven and let cool for 15 minutes or so. Liberally, spoon the poblano crema on top. Spoon a little more of the tomatillo sauce on top of that and garnish with the cilantro and onion slices. Squeeze a bit of lime over the whole thing and serve. Goodness! This looks incredible. I’m generally not a fan of greasy, creamy sauces but this one, I like. This is such a fabulous idea! Beautiful presentation too! Loving the ripples in that crema. CASHEW POBLANO CREMA is absolutely lovely creation. I haven’t done this one with cashews yet, thanks for the recipe! Yummy! You didn’t post this too late for me, looks like I’m going to be making the cashew crema to go with our fish tacos tonight. Lovely post. Enjoy the rest of the weekend! Gosh diddly DANG that looks amazing. I could snuggle right in it. This looks amazing. 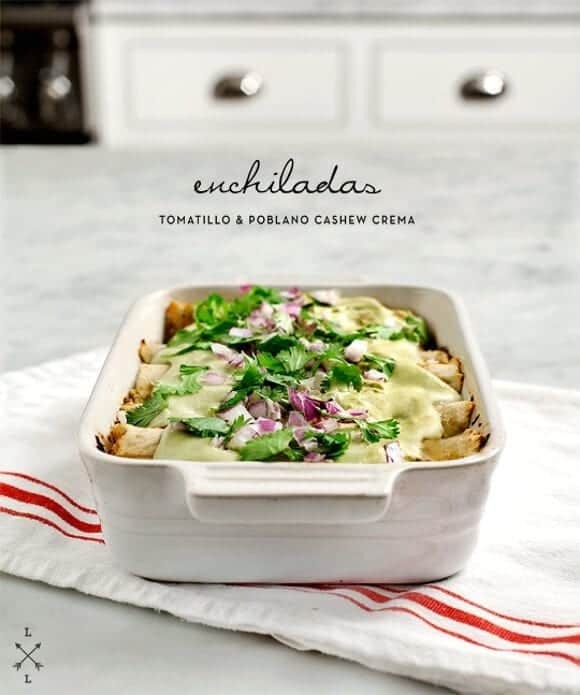 I have a mushroom and chard enchilada recipe that I love but I’ve never made a cashew crema to go with it. I can’t wait to try this! Thanks for the delicious recipe! Beautiful photos – I like your simple style. Thanks for the inspiration. I have added cashews to my shopping list and hope to try this soon. These look so good! I love making cashew cream and will totally try your poblano variety. For some reason I feel pretty much omnipotent every time I make anything with nuts in my Vitamix. That’s normal, right? I just got my vitamix only recently, I don’t know why I held out so long. Ha! Sorry, I’ve really embraced my nerdly tendencies in my 30s. Anyway, yay Vitamix. I should seriously start getting paid by them for all the free advertising I do…. WOW. 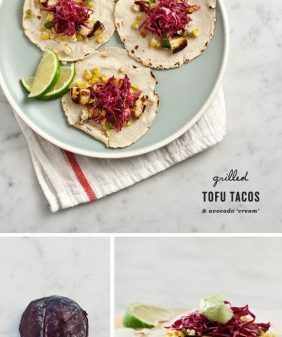 Made this for Cinco de Mayo for some non-vegan friends who are always saying negative things about vegan food, and got SOOOOOOOO many recipe requests. 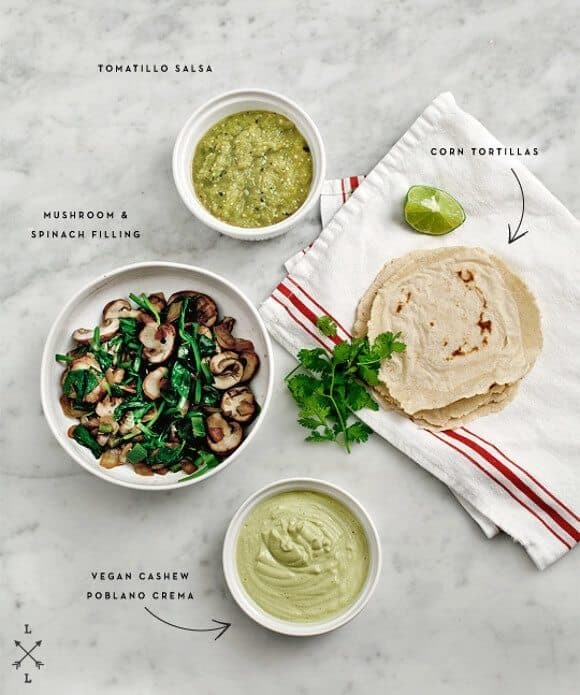 The Poblano Cashew Cream was a huge hit and no one believed it was non-dairy. THANK YOU. I can’t wait to try this when I have a day to myself. I love all the different elements. What a fabulous blog you have here. I’m so excited to stumble across it! Dang, lady! Those look so good. I am a new convert to using cashews in a vegan “cheesecake”! Love love love the idea of using them for enchilada sauce. I made this tonight and it was a hit! I changed up the filling a bit to use what I had around — some leftover zucchini and yellow squash, mushrooms, and kale pulp (left over from juicing). The tomatillo sauce and the poblano crema were both brilliant! Thanks! What a beautiful and thoughtful dish. Hi! 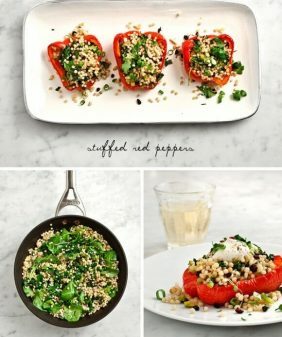 Love your blog and this recipe looks amazing! 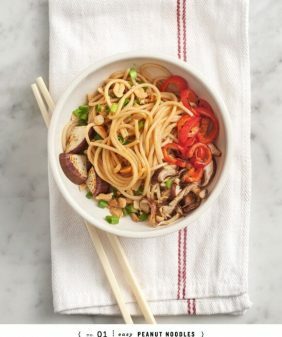 I’m actually allergic to mushrooms, so I was wondering what alternative would you suggest? 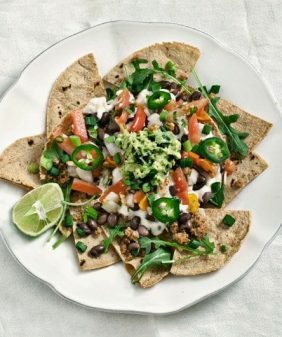 You could use any filling you like – spinach & corn, or tofu, black beans, red or green peppers. Whatever mix of veggies you like… sauteed with some garlic and onions. I made just the cashew crema to go with another Mexican dish, and I now have quite a surplus. It is absolutely delicious, but I was curious if you had any suggestions for other dishes/flavors to pair the leftovers with. I’ve used it as a thick dressing for a corn and red pepper salad, which worked quite nicely. Glad you liked it! I ate it on a bunch of salads. You could put it on tacos, with our without another salsa. Serve it as a dip with tortilla chips and chopped veggies. You could put it on sandwiches, or dollop over simple grilled veggies. It could work on pasta as a cream sauce. Depending on what you’re going to use it for, you can stir in some water to thin it out if it’s too thick. I FINALLY made this dish tonight.. I have had it bookmarked since you posted. I would look at it sometimes twice a week, seriously.. I can’t believe I waited this long! At the first of the year, I began the macrobiotic lifestyle.. I feel amazing and the results show inside and out. My old downfall used to be cheese. My husband is cheese lover himself. The poblano cashew creme – amazing! A very delightful, taste dancing dish – this is a must keep on everyone’s menu! I just made it with hatch green chile and lime and put it on top of acorn squash, broccoli, and basmati. Incredible thanks. You could eat this with anything! Esp the roasted pepper cream sauce…amazing! This was SUCH a great dinner tonight. Thank you so much for posting and creating this. I adore your blog and follow it every day! Looking forward to many more evenings with your awesome recipes!!! Thanks again! Wow! This was freakin’ amazing! I made if for dinner tonight and it got rave reviews. That cashew crema is heavenly! We used the leftovers in a kale, quinoa, black bean salad. I doubled everything but the crema to make 12 enchiladas for 4 of us. I did make two versions of the sauce, one with the jalapeno and one with 5 serrano chilies. Both were tasty, but the one with the serrano chilies was a hands down favorite. The combo of sweet and heat was delicious. Thanks so much for this recipe. We’ll definitely be making it again. Hi Emily, glad you liked it! 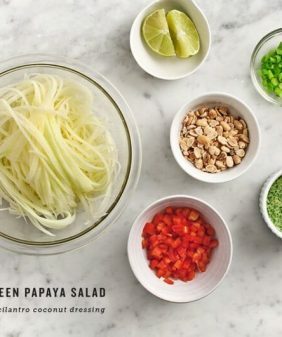 The salad sounds like a super delicious way to use the leftover cream :). This was fantastic! I substituted rainbow chard for the spinach and added fresh corn as well. The sweetness of the corn worked nicely with the tang of the tomatillo salsa and the heat of the crema. I skimped on making the salsa and bought a fresh tub of tomatillo salsa at the grocery store and that worked well. I’ll def be making this again. so glad you liked it, those sound like great subs! mmm corn! WOW – this recipe is absolutely amazing! So delicious! Anyone would want to be vegan/gluten free after eating this masterpiece. It took awhile to make this dish but it was worth every minute. Next time I would prepare the crema (which was to die for!) and the enchilada sauce in advance. I made this for a family dinner but can’t wait to make it for a dinner party. Thanks for all of the inspiring recipes! How long will the cashew poblano cream stay good in the fridge? 3 or 4 days – if it separates a little, just give it a stir. Delicious poblano cream sauce! I added a handful of cilantro and a squeeze of lime because I ran out of lemon. Yum! Worth the effort! Not that any component was particularly time-consuming, but for me this isn’t a weeknight dinner. Had some challenges with the crappy tortillas that Whole Foods stocks which are not pliable at all-even when soaked in tomatillo sauce. They cracked and broke up before baking so I had to start all over and soak them in oil then microwave them to soften them up. Annoying, but that’s solely because that brand is terrible and I was too lazy to stop at Fiesta for the good tortillas. I also doubled the tomatillo recipe and it was barely enough for 5 enchiladas, so I’d definitely recommend using more like 10 tomatillos. I also wish I would have added a lot more water to the crema-I usually like my cashew creme pretty thick, but in this case I could have added a good cup or more of water to thin it out. But this recipe is a winner. Will definitely be making it again! I mixed the poblano and tomatillo sauces together. I also did a different filing (chopped bell pepper, carrot, zucchini and tofu). This was so delicious and creamy and amazing. I will definitely make it again!! I made these last year as a vegan addition to our Easter dinner for my vegan daughter. And surprisingly, they were such a hit among vegans and carnivores alike that I’m making them again this year. Honestly, these are possibly the best enchiladas I’ve ever tasted.